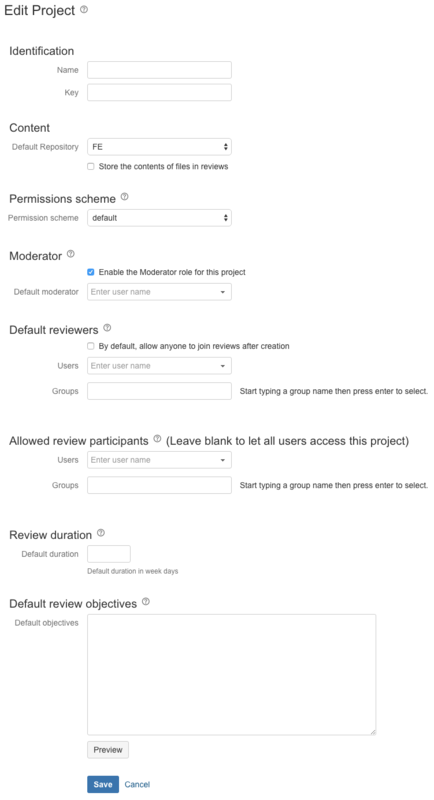 Once a project is created, an administrator can edit the default values for settings such as repository, moderator, allowed reviewers, allowed groups and permissions scheme. These are the settings that are applied to any new review created for the project. In the admin area, click Projects (under 'Project Settings'). In the list of projects, click Crucible settings under the three-dots menu (in the 'Actions' column) for the required project. Name – the plain language name as displayed in the Crucible interface. Key – the project key used when giving reviews their unique code names. If you change the key for a project all open, and closed, reviews in the project are updated with the new key. Default Repository – the repository that contains the source code for this project. This is the repository that will be searched by default when you add files to a review. Store the contents of files in reviews – check to have the source files under review stored in the Crucible database, along with the comments and review data. This retains a copy of all the source files under review even if the repository is disconnected from Crucible. See Storing all revisions under review. Enable the Moderator role – clear to have reviews run by the author only. See Enabling the moderator role. Default Moderator – the user who will be set as the moderator for all new reviews created in the project. Leave this field blank to force the review's creator to choose a moderator. See Creating a review. By default, allow anyone to join reviews after creation – sets the default state of the Allow anyone to join checkbox on the 'Choosing reviewers' screen. See Choosing reviewers. Users – choose the individual users to whom new reviews will be assigned by default. Groups – choose the groups to which new reviews will be assigned by default. Allowed Review Participants Use Users and Groups to restrict who can participate (as a author, creator, moderator or reviewer) in this project's reviews. Only these user's names appear when you assign users. Leave these fields blank to allow all users to be assigned to reviews. Review Duration Default duration – the default length of time (in week days) for reviews in this project. If you leave the field blank, then no time restriction is applied. Reviews that are overdue will show up in red on the reviewer's dashboards. Note that the review duration only affects the default due date that appears when creating a review. The review's creator or moderator can specify a different date if they wish. Default Review Objectives Default objectives – specify some text that will appear by default in the Review objectives field of each new review. This text can be edited, as with any text in the Review Objectives text box. See Setting default review objectives. Add additional Fisheye repositories to the project if required – click Edit in the 'Fisheye content' column. See How to add several repositories to one project in Crucible for further information.